This little car is one Dr. Keim purchased when he was 12 years old. We decided to resurrect it from his garage, put new wheels and engine in it and use it as a marketing tool. Dr. Keim has children old enough to drive it and did so in the Harrisburg parade. 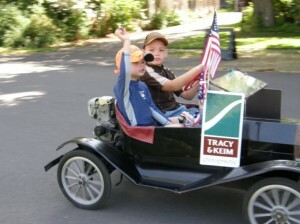 Dr. Tracy has great nephews who thought it was the best when they drove it in the Coburg parade. We hope to see you at the Eugene Celebration parade Saturday August 25th, let us know if you see us! !